Sudoku puzzles have been mind boggling since the time they were invented. For everyone who is not a fan of word puzzles and is out of exciting puzzles again, take a break brings you en exciting magazine filled with the most tangible yet interesting and challenging Sudoku puzzles. Take a break is famous for its world class puzzles and innovative techniques for amusement. 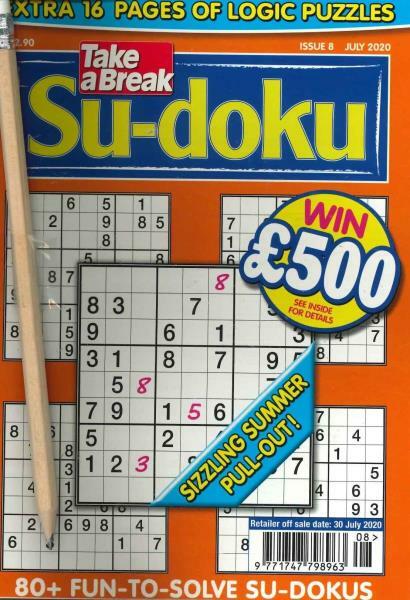 Try Sudoku for a change. For those who are uninitiated with the Sudoku puzzles, it is quite easy to grasp. Sudoku is a 9x9 matrix with random numbers filled and you have to complete the whole of the grid. All you have to do is fill each and every square using the only digits ranging from 1 to 9. The only thing you have to keep in mind is that none of the digits must be repeated in a row, column or cube. Take A Break’s Sudoku magazine is an adventurous and exciting challenge for all those puzzle lovers out there and especially for the diehard Sudoku fans! Excel the art of Sudoku puzzle solving and you and be an ace amongst your friends, colleagues and even family members.